Learn about dinosaurs, as well as other amazing flying and swimming prehistoric creatures, as you scratch and sketch your way back in time millions of years ago. With the handy wooden stylus, scratch away the black coating to reveal the glittering colors and patterns beneath. 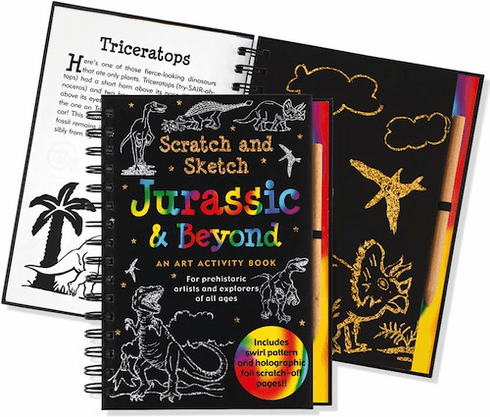 Use the sketch pages to copy anything from an Allosaurus to a Velociraptor, or to invent some fantastic creatures of your own, if you wish! Ages 7 and up.